Police investigating the disappearance of a BBC Bristol and Somerset radio presenter believe he may have travelled to the Lake District. Peter Rowell, 52, of Wickwar, South Gloucestershire, was filmed on CCTV walking out of a Morrisons car park in Yate at 0945 BST on Tuesday. He is believed to be depressed after his father's death. Cumbria Constabulary said it was making inquiries in guest houses and putting up posters in police stations. Police have also confirmed they are carrying out a search on the banks of the River Frome which runs through Yate and that his home is being searched for clues as to where he may be. Mr Rowell, who did not turn up for work on Tuesday, had been seen leaving his home at 0830 BST and his car was later found in the supermarket car park. Tim Pemberton, editor of BBC Bristol, said: "We are obviously very concerned about Peter and doing everything we can with police to help find him. "Peter's been with the station for a year now and proved incredibly popular with listeners and his colleagues." Avon and Somerset Police said it was using the force helicopter to search the area. Det Ch Insp Ian Norrie said: "We know from CCTV his location up to about 9.45am yesterday [Tuesday] morning. "Since then we've had no confirmed sightings and we are unaware of where he has gone." The CCTV shows Mr Rowell getting out of his car with a holdall or rucksack. Police believe he put items from the boot of the Jaguar into this bag. It also shows him putting on a dark-coloured beanie-type hat, gloves and a dark-coloured jacket - possibly a fleece. Det Ch Insp Norrie said: "We think he might have headed in the direction of the nearby Yate train station from the supermarket, but there is no CCTV which can confirm that, so we do not know for sure which direction he went in. "Since we issued our appeal for help in tracing him, we have received a number of phone calls from people, which we have been following up." He asked anyone who saw or spoke to Mr Rowell on Tuesday, or has any knowledge of his whereabouts, to contact police. "Since he went missing his mobile has been turned off so we've not been able to establish if anyone has had contact with him," he said. "His family are naturally very upset and fully supporting the efforts of the police and are asking Peter to get in touch. "He is a very well-known local celebrity - people will recognise him if they see him. We are hoping the public will report any sightings to us," he added. Mr Rowell, originally from Sunderland, presents the Afternoon Show on BBC Radio Bristol and BBC Somerset - a mixture of music and celebrity interviews. He has worked at BBC Bristol since last May and is a well-known face in the West Country, making many public appearances. Cumbria Constabulary confirmed it was helping detectives from Avon and Somerset Police. Mr Rowell has previously been a news presenter for ITV West and worked as a DJ on commercial radio station GWR in the 1980s - now part of the Heart group. 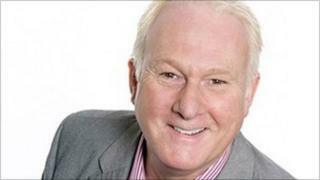 He started his career working for the BBC in Newcastle as a presenter on local radio and television. Mr Rowell is described as a white man with white or silver hair. He is 5ft 10ins (1.77m) tall and of stocky build. He is possibly wearing brown jeans and a white shirt.